We’ve been working on hydrating better while we are outdoors and have seen improvements during and after exercise. Below we share our tips. We always think of layering and jackets for fall and winter weather, as that’s when they’ll see the most use. However, it’s still always a good idea to have a dependable, lightweight jacket in warmer weather, to protect against those chilly mountain mornings or when light rain or a cold front work their way in. In fact, we keep a lightweight jacket in our pack all summer as part of our emergency kit. A good ultralight summer jacket will be thick enough to keep out the chill and wind and keep some light rain and moisture off you, without weighing you down. It may not provide the protection of a fully insulated or waterproof layer but can prove to be even more versatile. You want to be able to throw it when you get a bit chilly but remain light and cool as you start to work up a sweat. So what are we using? 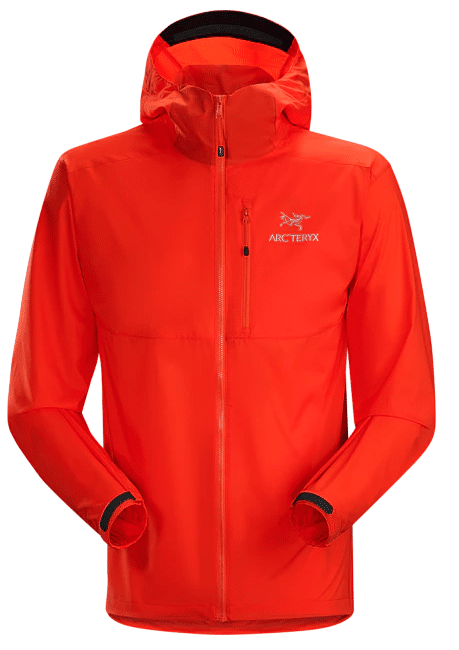 Our favorite lightweight jacket for these occasions is the Arc’Teryx Squamish Hoody. The Squamish is made of light, wind-resistant material. 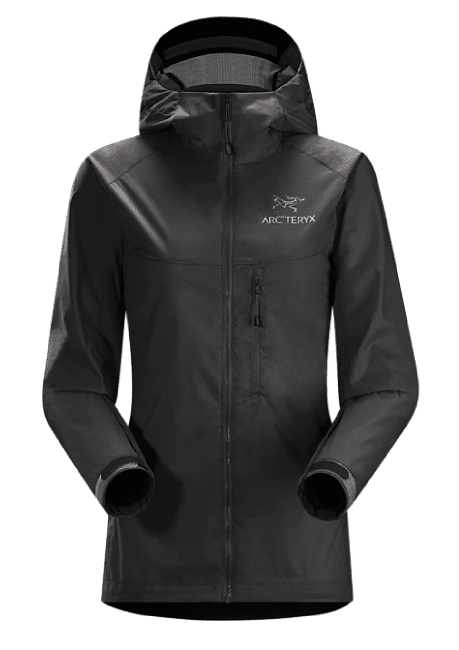 It’s fully-breathable and cut into the same slim, athletic cut that you’re accustomed to getting from Arc’teryx. Essentially, it’s an ultralight version of the full-blown Alpha FL hardshell, with the same chest pockets and gusseted design. The men’s version of the Squamish only 155 grams (5 ounces), while the women’s version is even lighter, at 140g (4.9oz) it’s the perfect weight and thickness for blocking out wind and chilly mountain temps in the summer and does a decent job of repelling light rain and moisture, thanks to its DWR coating. It also features Arc’Teryx’s Stormhood, which is designed to be compatible with helmets and is easily cinched down with the one-handed draw cords and rotates with your head as you move. 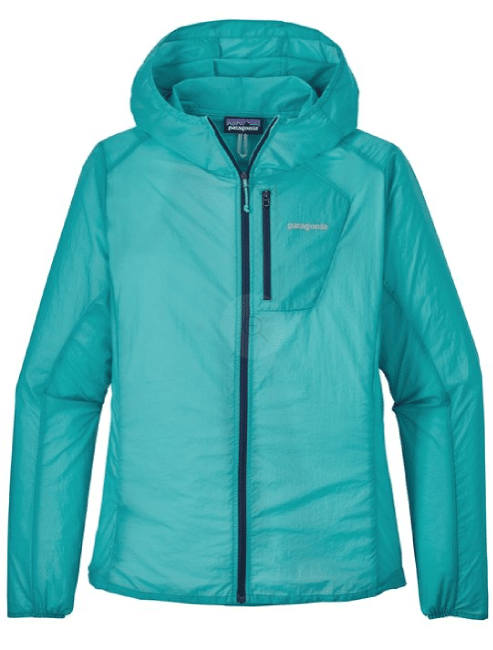 Another jacket we like is the Patagonia Houdini, which also has both a men’s cut and a women’s cut. Besides having an awesome name, this ultralight windbreaker made of abrasion-resistant nylon ripstop and coated with DWR. The slim fit is athletic and flexible, and all the hardware (toggles and cording) are all slimmed down to cut down on any bulk. Patagonia also added half-elastic cuffs that seal around the wrists, and a draw cord at the hem. The men’s version is 102g (3.6 ounces) while the women’s version is only 94g (3.3 ounces). At this weight, the Houdini is a barely-there ultralight hoodie that packs down easily and is good for summer and 3-season use at high elevations, and for running and biking in the rain at lower ones. 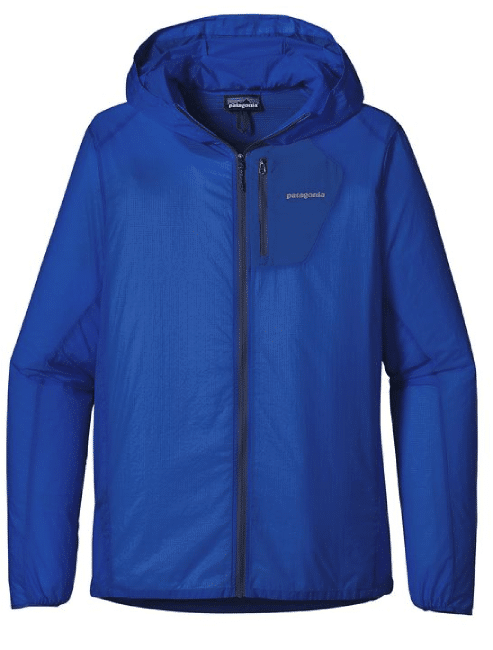 If sheer convenience is the name of the game, you may want to check out Outdoor Research’s Tantrum Hoodie. This wind shell is made of ultralight, stretchy fabric (100% 20D nylon ripstop) that gives you some cover from wind and light rain but lets you breathe without weighing you down. The fitted hood is adjustable and tightens with a single cinch on the back of the head to remain comfortable close to you during active pursuits. At 4.7 ounces (133g) this is another light jacket that is perfect to keep in your pack all summer. But the best part of the Tantrum Hoodie is just how packable and convenient is. It packs into its own back pocket and has an elastic band and buckle, which let you carry it around your waist or over your shoulder – so there’s literally no need for a backpack to carry it in. It works just as well for longer adventures but is especially convenient when you’re heading out on a run or short ride and don’t want to pack a bag. The trick in choosing an ultralight coat, of course, is to find the jacket that works best for you. If you’re heading into the backcountry and need more protection from the rain, you’ll probably want to reach for the Squamish or Houdini. If you’d just like a reliable hoodie for running and biking and don’t need a pack, the Tantrum Hoodie will work great. Try one out for yourself and be ready for anything the weather throws at you this summer.